The Upper Peninsula of Michigan is definitely different than it’s southern counterpart. Only 3% of the state’s population lives up here. They actually have their own state fair, as they are so far removed from Detroit. The weather in the U.P. Is sometimes referred to as 9 months of winter, followed by 3 months of bad sledding. 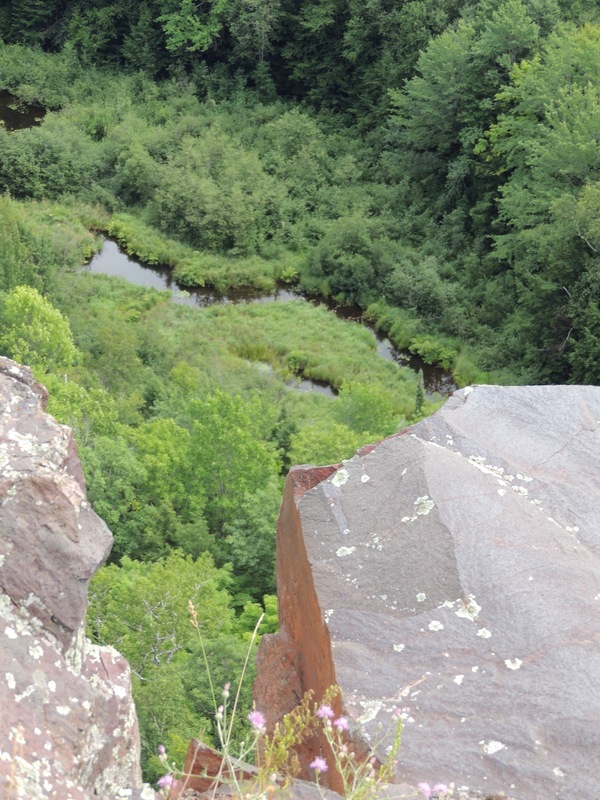 Ontonagon averages 200 inches of snow each year! After spending the night at the KOA in St. Ignace, we set our course west for the Porcupine Mountains. The Porkies, as they are affectionately called, have been a draw for Diana and I for years. We both were there as teenagers, and were there together one time during the 1990’s. We left the KOA in a thunderstorm, which was the first rain we had seen in quite awhile. Behind us, a little drama was unfolding on the Mackinac Bridge. A wind gust had blown this RV onto it’s side, closing the bridge. There is a very good reason they want high profile vehicles to go 20 miles an hour! As we made our way west on US 2, our weather cleared up. 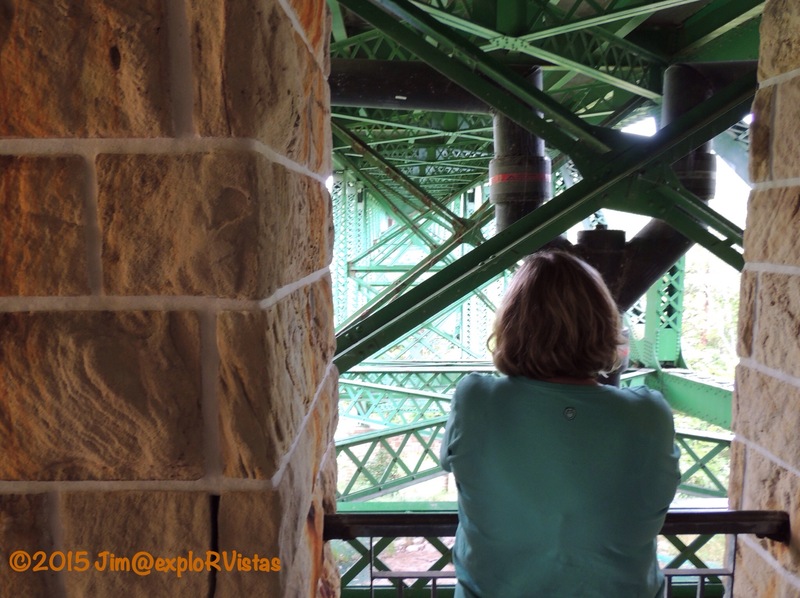 We stopped at the Cut River bridge, a favorite place to explore. Michigan’s Department of Transportation maintains parks on both sides of the bridge. 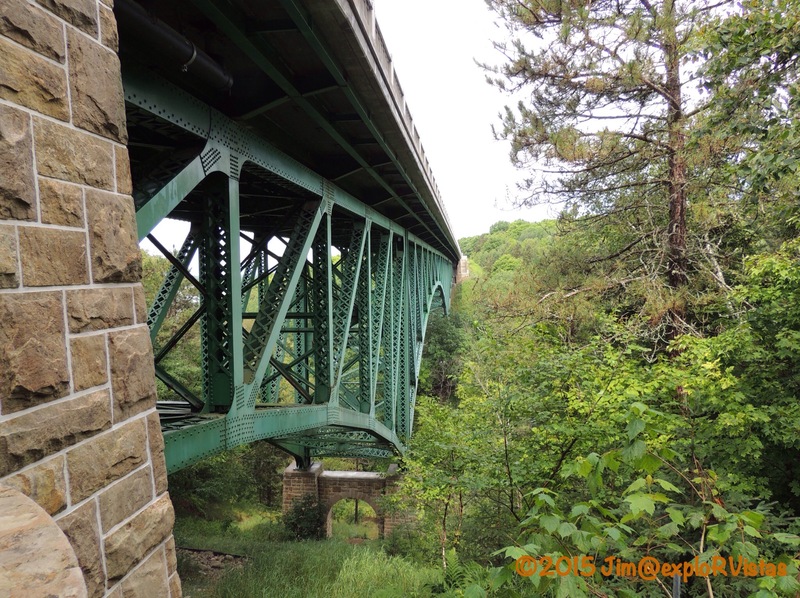 From the roadway, the beauty of the structure and the gorge below can’t be seen. 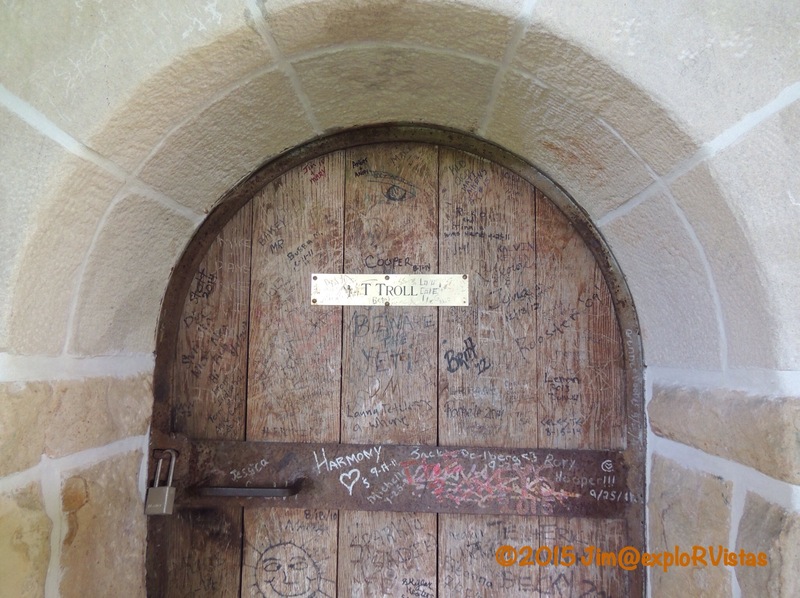 It is definitely worth stopping to take a look. Here is Diana checking out the superstructure under the roadway. This is what they saw coming at them at Sleeping Bear. Glen Arbor and the national lakeshore took the brunt of it. Latest reports indicate that Glen Arbor sustained straight line winds of over 90 miles an hour! M-22 coming in from the south is still impassable, 2 days later. Fortunately, no one was killed. Wild Cherry never lost power, and just had a few branches down. The photo above is on what was a heavily forested stretch coming into Glen Arbor along Glen Lake. It was a gorgeous drive. So sad…..
Back to our trip: We continued west to Marquette for the night. Going on a tip from Cherie and Chris at Technomadia about casino camping, we stopped at Ojibwa Casino, east of Marquette. The casino actually paid us to camp there! They gave us each $15 in free slot play, a free mixed drink (or beer), and $10 in match play for blackjack. We passed on the blackjack, and we came away with almost $10 total from the slots. Oh, and this wooded campsite was free! It even included 50 amp electric! For anyone thinking about staying here, make sure you come with a full fresh water tank and empty holding tanks. They don’t have a dump station or water available. We ended up dumping farther west on Monday at Van Riper State Park, which was free with our Michigan Recreation Passport. Thanks to the Ojibwa nation for the hospitality! 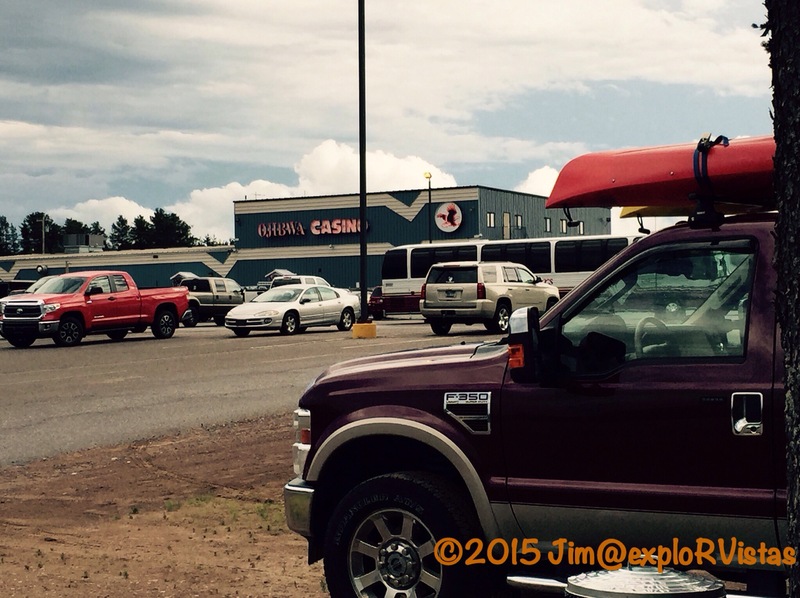 Our next stop was River Road RV Park in Ontonagon, Michigan, which is the eastern gateway to the Porcupine Mountains. We set up camp for a few days of fun in the area. 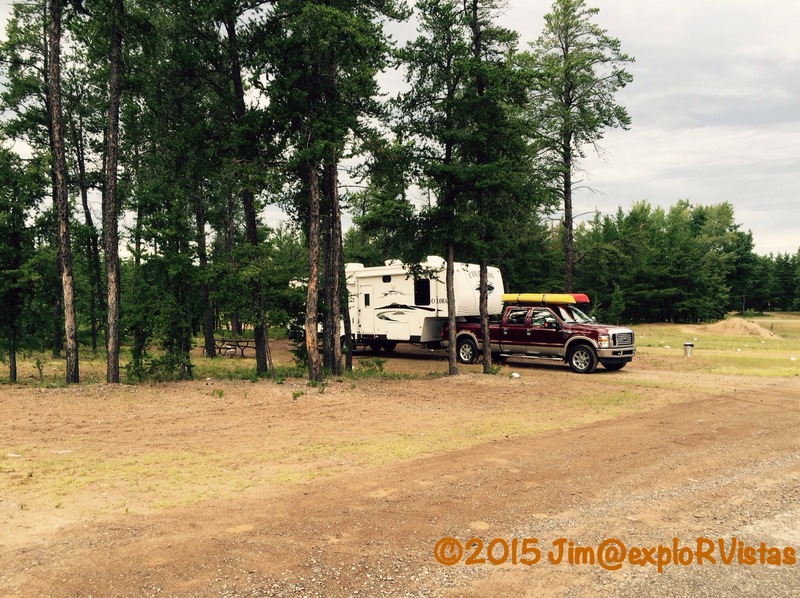 We were given a nice full hookup site, just a few yards away from the Ontonagon River. 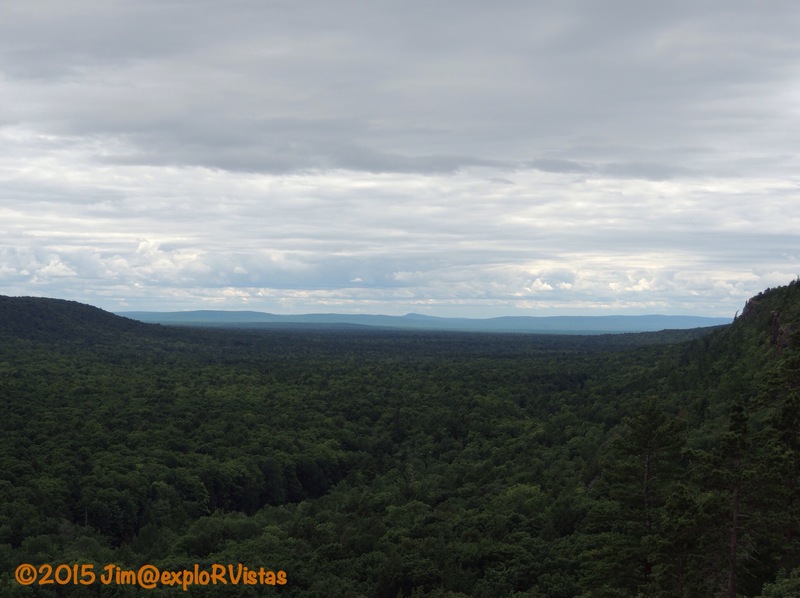 Late Monday afternoon, we headed up to the visitor center at Porcupine Mountains Wilderness State Park. We discovered that the state park was established in 1945 in response to the U.S. National Park Sevice contemplating making it a national park. Michigan wanted it for their own. Diana first came here with her family in the early 1970’s and I came with a buddy in 1975 at 17 years old, just after getting my driver’s license. After we left the visitors center, we headed up to Lake of the Clouds. The lake is accessible by foot trail only, and is totally surrounded by wilderness. There are no boats to be seen on this beautiful body of water. The surrounding hardwood forest in the park is the largest stand of virgin, old growth hardwoods west of the Adirondack Mountains. The fall colors here are outstanding in late September. 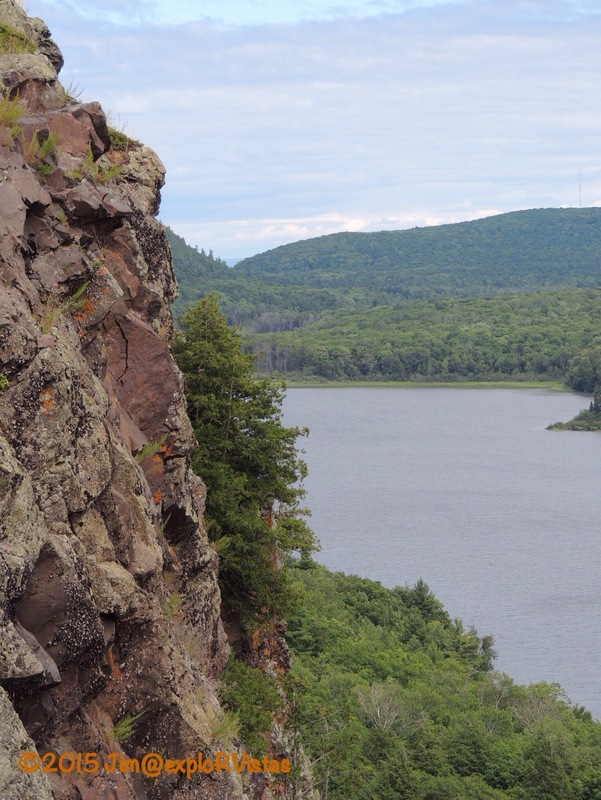 The viewing area is on an escarpment high above and adjacent to the creek that feeds the west end of the lake. 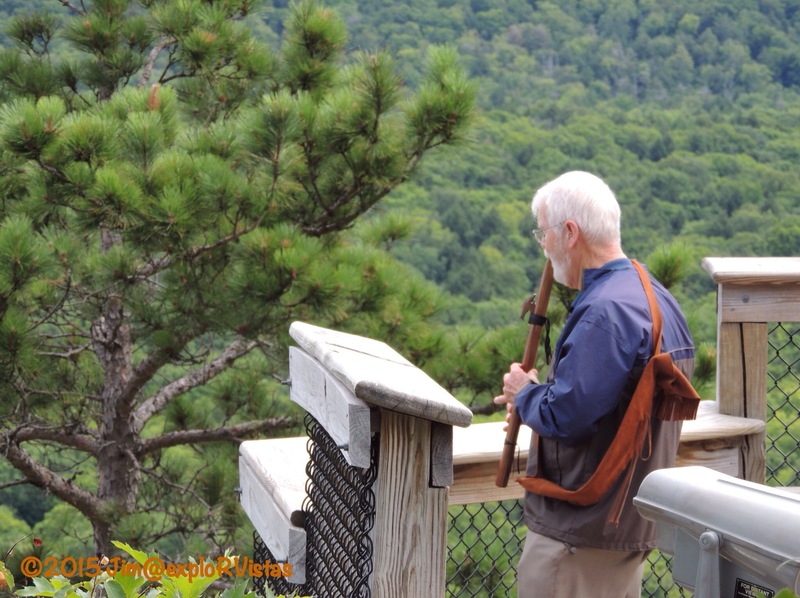 This gentleman was playing a Native American flute on the boardwalk at the edge of the cliff. 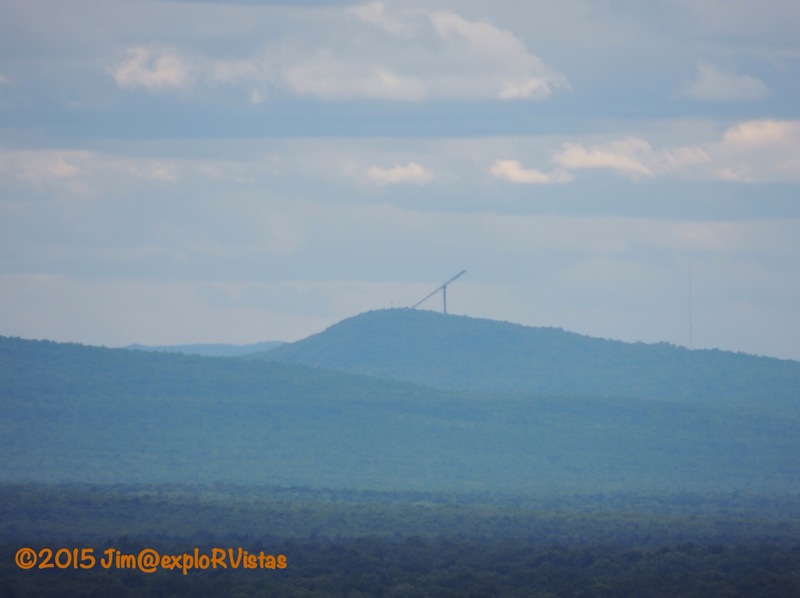 Zooming back out shows just how vast this wilderness is. We have more of the park to explore, and we look forward to passing along our discoveries. The Upper Peninsula is definitely a unique place to visit! Beautiful country. Thanks for the review. Yup it is wilderness up there. Looking forward to more about the Porkies since we bypassed it last year. And that motorhome is truly in big trouble! What a beautiful country we live in! Thanks for sharing. It certainly is! Thanks for reading! If you don’t mind, Jim, I’ll let you have the Ski Flying! I love that drive along US-2. Ya know, in three, going on four years we haven’t yet been to a casino for an overnight! We had been planning on doing that this year coming across ND had we taken a more northerly route, but then the heat came up in Eastern WA and ID and we opted to swing just a bit south and ended up never making it to a casino. I already looked at our route S to Bosque del Apache for October and I didn’t find any casinos within easy striking distance for that trip either. Oh Well. Always scary to see an RV on it’s side. Too many RV’ers just don’t realize that driving speed has an impact on their safety in seriously windy weather. Who wants to learn that way! I first saw that hill in my teens, and I’ve never heard of ski ‘flying’ except for here. I’ll watch from the bottom, also! We aren’t big casino people, but we don’t mind taking a $20 each into one once a year or so. This one was pretty tiny, Peter. From what Chris and Cherie said, this is the best deal in the U.P., as far as camping. It worked well for us! 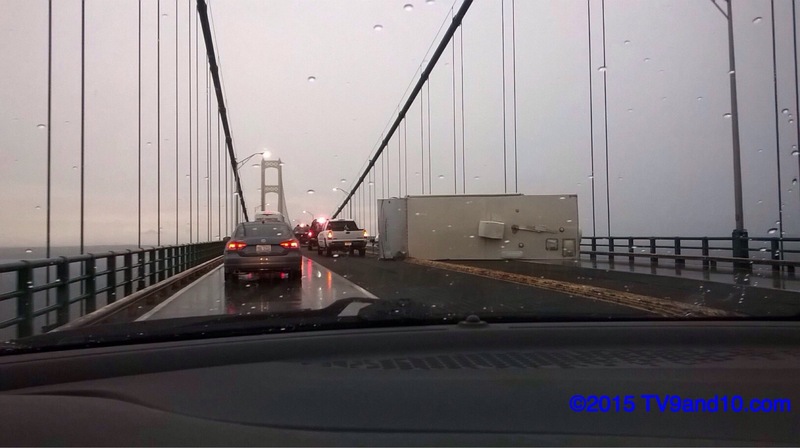 There is a photo of a semi on Google Images (Google ‘Mackinac Bridge wind tip over’). That trucker was thanking those suspension cables! That storm was a scary one. We just got a little wind, hail, and rain, but 20 minutes N.E. of us a tornado touched down. That sure is beautiful country in the UP. MI is by far one of the prettiest places in the fall (even surpasses CO in the fall). Enjoy your trip. 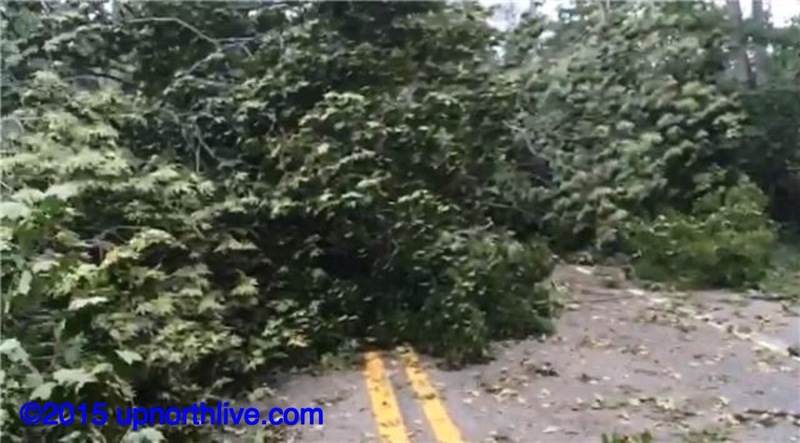 I can’t imagine the folks at D.H. Day campground with all those trees crashing down around them. There were people climbing back up the bluff at Pierce Stocking also. They said the sand felt like a thousand needles stinging them. Yikes! We have yet to get to the Porkies in the fall. It is on the list for the future! Great post! That area is definitely on my bucket list – especially since watching a show on TV about that bridge and how hard it was to build there – largely b/c of the winds! 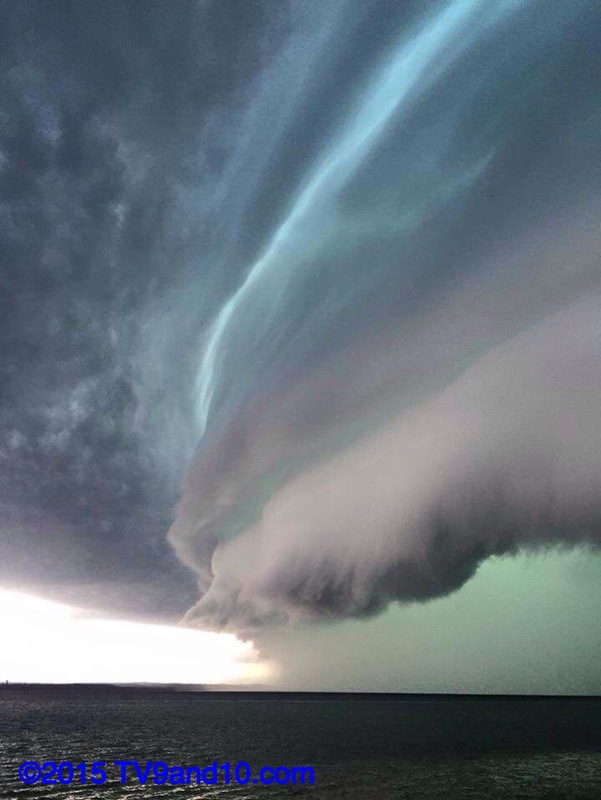 That pic of the storm is beautiful – yet SCARY! Glad I was no where near it! So sad about that rig on its side! You will love it up here, Kelly! Too bad it rained on you when you were here, Gin. Better weather next time! We stayed at the Ojibwa Casino last summer! Great big site, especially for free. We came out $24 ahead!! Sure can’t beat that!! That is a wicked storm cloud. Glad we weren’t in Empire. That poor RV! We don’t enjoy seeing things like that. We saw a Bounder on its side and apart a few weeks ago. Very scary! Not the fanciest casino in the world, but we had fun! You did better than we did, Pam! We are dreading seeing Glen Arbor. There were so many beautiful trees, especially coming into town from the south. RV’s have to be so careful on that bridge. The grating in the center lanes can allow a gust to come up from underneath and topple a rig. Of course, that same grating keeps the wind from destroying the bridge! It definitely added to the ambiance! That overlook has sure changed in the 40 years since I first went there. They had a stone wall back in the day, but none of the wooden walkways. It is quite a nice place to visit, Tracy! That looked like one massive storm. I recall when we crossed the Mackinac Bridge towing our 5th-wheel, the signs were flashing to drive no faster than 20 mph due to high winds. 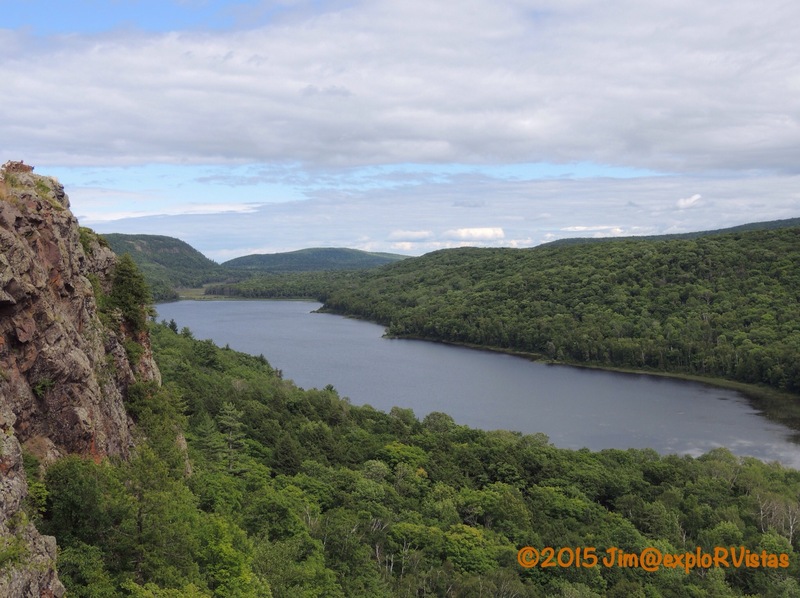 I will be bookmarking this post for exploring the Porcupine Mountains. Looks wonderful! So glad the bad weather missed you. Those clouds looked amazing. Adding the Cut River Bridge to my Michigan Travel Board. It will be interesting to see the Leelanau Peninsula when we get back, Bonnie. That was a really bad storm. We have Perception Swifty 3.1 kayaks. They are 3.1 meters long…about 9 feet plus. They weigh in somewhere between 30 and 40 pounds. Ours are over 20 years old and are in great shape. Nice thing about a Perception is the grooves molded in the underside. They help the short boat track straight…something that would be a problem otherwise. We tried an Old Town the same length and we’re all over the place. That is what sold us on the Perception. They carry well on the truck…in fact, I never take them off between paddles. Their short length works well with our fifth wheel…but even a two seater can be hauled on a properly equipped fiver and pickup. Down the Road with Steve and Debbie have one, if you want to check out their blog.